After 10 years of success Jasmine Dragons Acrobatics, Dance, or Aerial Silks can be added to your studio. Matt can train, consult, supply equipment , help to get you going! 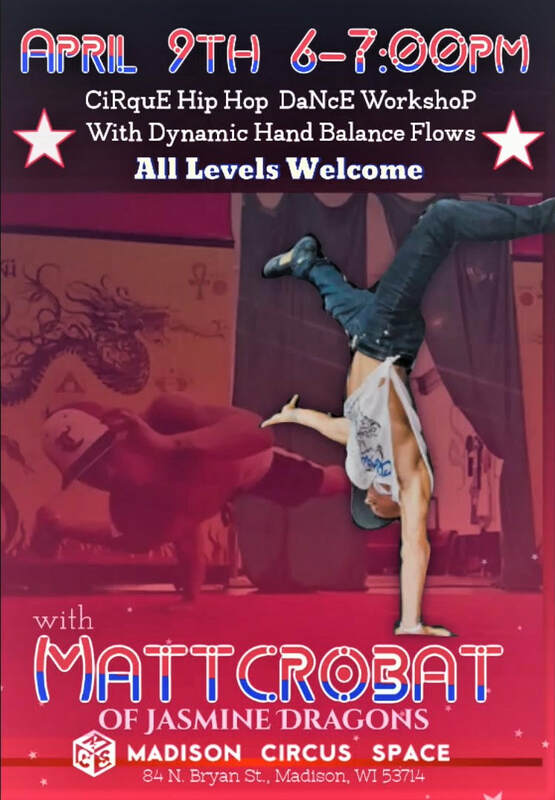 Mattcrobat can be booked for private party's, corporate, night clubs, event entertainment and workshops across the country. Matt has competed and been on world stages in places like NYC and Las Vegas. His passion for performing is in his ability to get his body to move and do some amazing things to share, give excitement, inspiration, or simply enjoy. Matt has performance teams from acro doubles, aerial silk dancers, break dancers, Pole dancers, flips and trick star tricking teams. Matt has spoken at many schools for career days and does and every day super heros themed assembly. Sometimes its not about telling kids what not to do, but show them some inspiring things they can focus on and do. From catholic, to public, to home schooling; Matt has passion and a natural ability to connect with todays youth and set their paths in healthy more balanced ways. Mattcrobat offers parent training in knowledge if they would like to have aerial silks set up at their home. All the correct hardware, rigging, and set up. Get the right quailty the first time, and learn from Matt on what to have the child to do and what to not. Aerial Silks can be an amazing stretch and strength item to have at home if respected and cared for. Cant text or be on a phone while doing it! Mattcrobat can be booked for semi private classes 1-4 people. Matt enjoys families and friend groups to bond, get strong, and do things they never thought they could. Class has core warm up, some hand balance, partner acro, and aerial silks. Class time can be customed to what you are looking for. Email or book through open time offerings. Traveling to any state or place is an option if travel accomodations are factored in. Matt has some certifications in personal training, group trainings, yoga, current cpr, but holds his Jasmine Dragons Youth Acrobatics at the Top. 15 plus years of coaching youth, 10 plus as private gym owner, passion for helping others- limitless. Geared towards fun and creative dance movements to take home. Workshop Class time will consist of a warm up in foot, hand, body balance alignment/calibration with exercises to build core strength. Some personal style dance time with direct one on one tips. Learn some global communication style movements in dance with acrobatics to express. Discover and learn ways to find the best way your body balances using tips from Matt. Must Register here so we know, class size is limited. 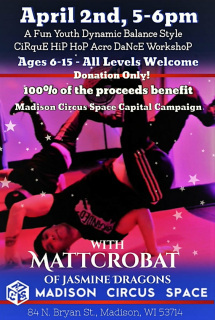 Can show up day of or schedule a future class with mattcrobat in Madison.Please include name and age of participant. 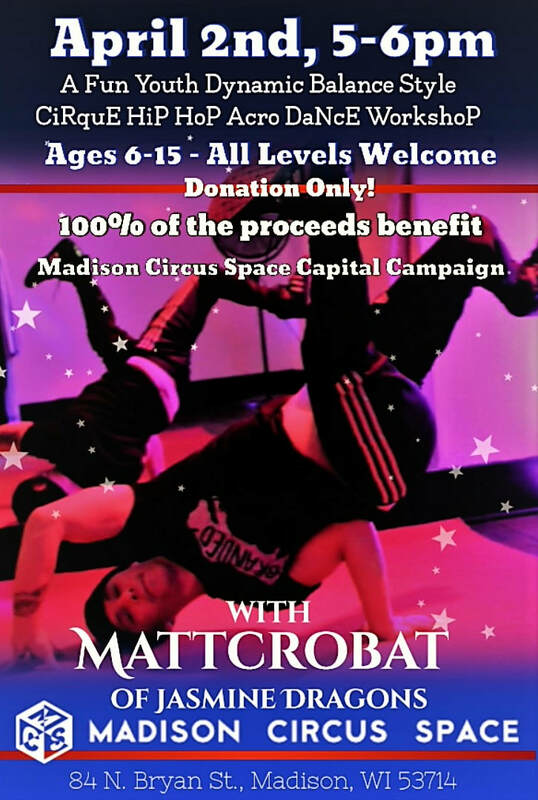 Donations cash, check, or card can be made day of or via Madison Circus Space. https://madisoncircusspace.com/donate/"
Teacher training at Open Way YOGA in huron ohio.